30 min. video: The Slovenska Strela under restauration. English subtitles. Unusual is the open Gendarmerie car that Alfred Umgeher from Lower Austria has brought to the Veteran Meeting. His 1950 Type 18 is the sole roadworthy specimen of its kind. Back then, Austro Tatra in Vienna converted half-finished Volkswagens into cabriolets for the Austrian Gendarmerie in a mini-series of nine cars. 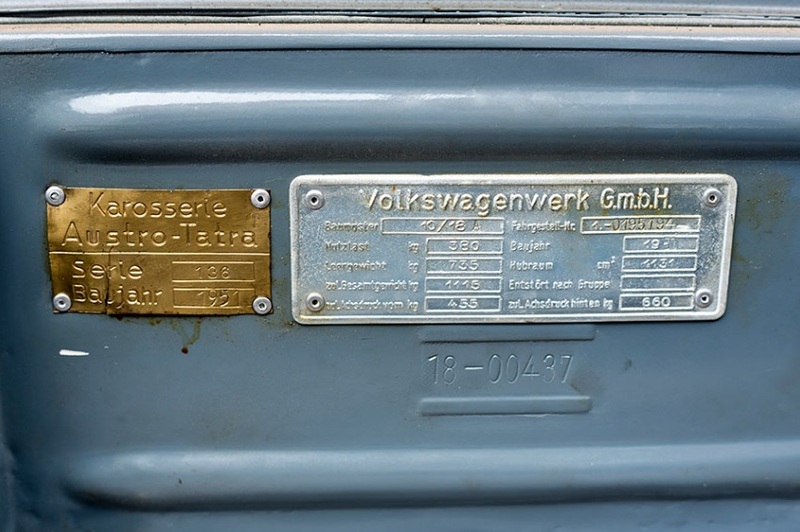 This particular official vehicle is utterly unique with its hand-made parts such as longer doors and a trunk lid fitted for a second alternator, wider door sills and other adjustments. 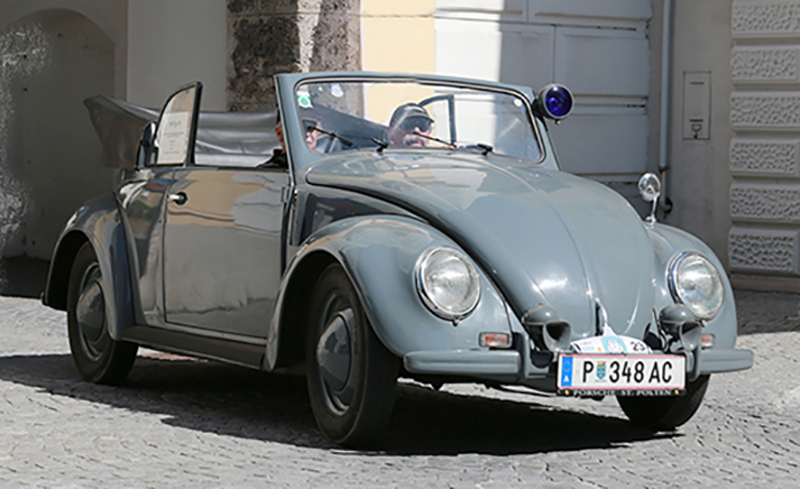 After two years of reconstruction, the Gendarmerie Cabriolet has been back in use for almost 20 years – with Alfred Umgeher driving the 24.5 PS veteran in style on special occasions. 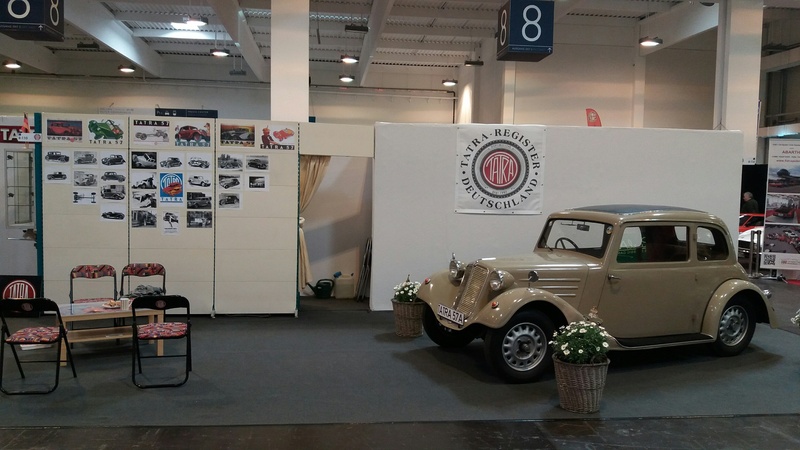 Both military and civilian vehicles from the legendary Tatra brand will be produced and serviced in the Slovak city of Trenčín by a special branch of the Czech group. The MSM company created the Tatra Slovakia joint venture in cooperation with the Tatra Trucks Kopřivnice group. The task of the new company is to repair, service and develop and produce Tatra vehicles for the defence industry as well as the civilian sector. Within three to five years, the production rooms in the former Military Maintenance Company (VOP) in Trenčín are to be expanded and adapted, and 100 to 150 new employees are to be hired, head of the Trenčín division of the MSM Land System Miloslav Bobek told the TASR newswire. 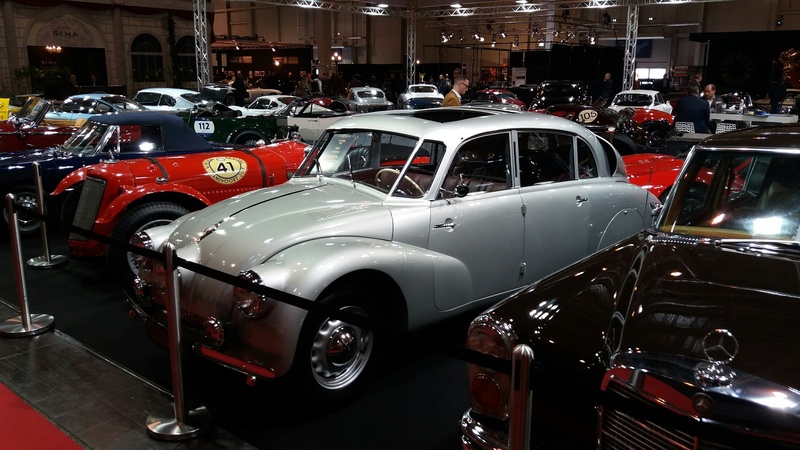 The Tatra brand is the third oldest car brand in the world, and with a hundred year tradition, the vehicles being much in demand all over the world. The MSM Group consists of several plants in Slovakia, with also a branch in Serbia. 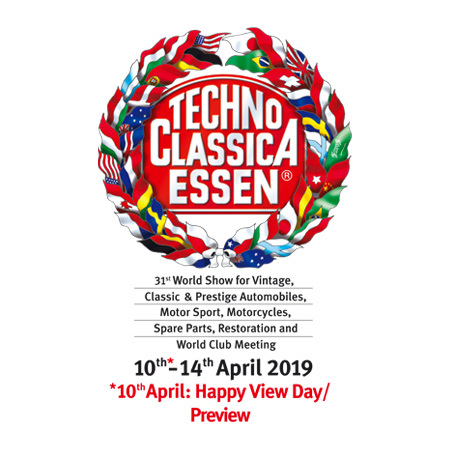 It focuses mostly on special technology and the defence industry: the Trenčín plant specialises in wheeled and tracked technology, the Nováky plant in ammunition and the Banská Bystrica one on the aviation industry. The MSM Group is headquartered in Dubnica nad Váhom, where the production of small-bore and big-bore ammunition is located. Around 300 people currently work in Trenčín, while there should be up to 500 employees within five years, TASR reported. On my seventieth birthday in 1990, my brother Edi fulfilled a secret life-long dream. He gave me a vintage car from 1938, a Czech Tatra in silver, which had converted from a wreck into a high-level car in a month-long restoration: three-liter engine, air cooling, oil circulating pump, 75 hp, top speed 160 kph, Rubens inspired curved wings. As a 15-year-old I had seen such a car on the Novy Jicin (Neu-titschein) city square. He belonged to the hat-maker Hückel, cost as many as five Volkswagens, and attracted many admirers, including my brothers and myself. Since then, I had dreamed of driving such a car once. At that time the car was regarded as extremely avant-garde – 55 years later it was still. It had only one construction fault: because of the all-too-big wheels and the long tail fins, it reacted very sensitively to sidewind. Only one thing helped: slowing down. It also had some quirks because of his age. But I also have quirks. So we matched together wonderfully. I was indefinitely grateful to my brother. He could not have given me a bigger gift. The trips I took on the red leather driving seat, are among my best memories. Zu meinem siebzigsten Geburtstag im Jahre 1990 erfüllte mir mein Bruder Edi einen heimlichen Lebenstraum. 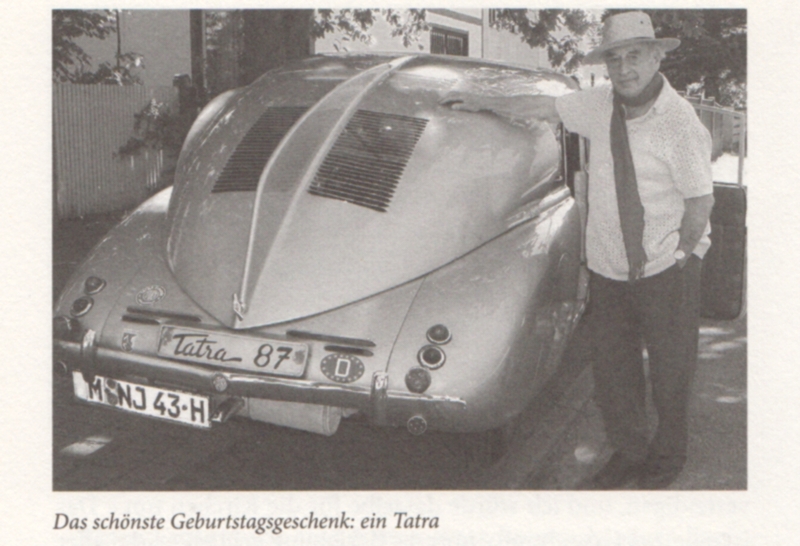 Er schenkte mir einen Oldtimer von 1938, ein tschechischer Tatra in Silber, der sich in Monatelanger Restaurierung von einem Wrack in ein Hochelegantes Auto verwandelt hatte: drei-Liter Motor, Luftkühlung, Öl-Umlaufpumpe, 75 PS, Spitzengeschwindigkeit 160 km/h, rubensartig gewölbte Kotflügel. Als 15-Jähriger hatte ich auf dem Neutitscheiner Stadtplatz einen solchen Wagen gesehen. Er hatte dem Hutfabrikanten Hückel gehört, so viel wie fünf Volkswagen gekostet und viele Leute herbeigelockt, die ihn bestaunten, auch meine Brüder und mich. Seither hatte ich davon geträumt, einmal einen solchen Wagen zu fahren. Seinerzeit galt er als ungeheuer avantgardistisch – 55 Jahre später war er es noch immer. Er hatte nur einen Konstruktionsfehler: Wegen der allzu grossen Räder und der lange Heckflossen reagierte er sehr empfindlich auf Seitenwind. 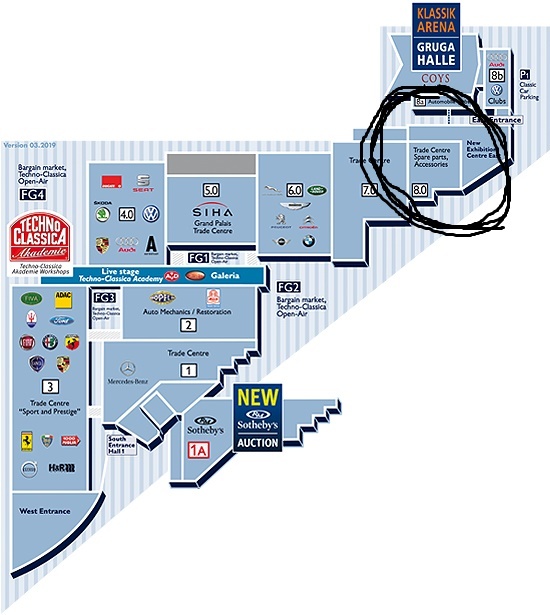 Da half nur eines: langsamer fahren. Auch sonst hatte er wegen seines Alters einige Macken. Aber Macken habe ich auch. Insofern passten wir wunderbar zusammen. Ich war meinem Bruder unendlich dankbar. Ein grösseres Geschenk hätte er mir nicht machen können. Die Fahrten, die ich auf dem Roten Ledersitz hinter dem Steuer unternommen habe, gehören zu meinem schönsten Erinnerungen. 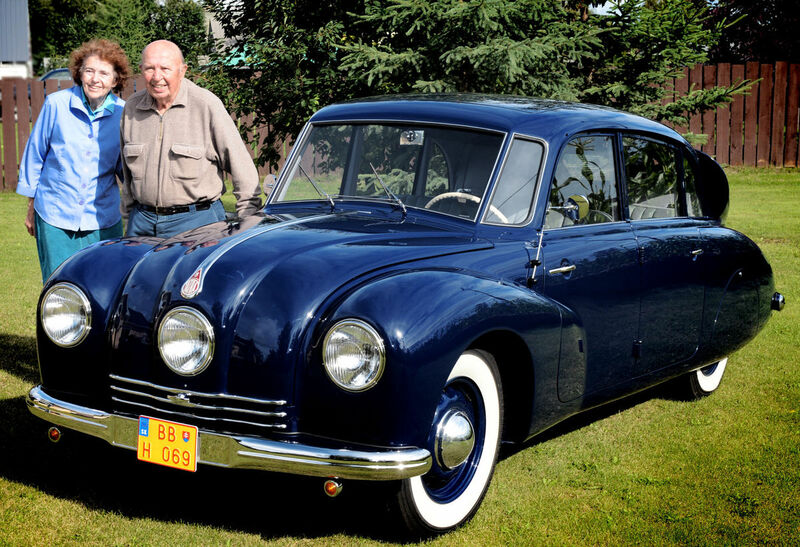 FAIRBANKS – The Golden Days Parade this year features two Czechoslovakian imports that both traveled a long way to be here — Paul Gavora and his newly-renovated Tatra 87. Much of the information here is courtesy of the Gavora family. Paul Gavora, of course, is a well-known Fairbanksan. He was born in the small village of Brezova in western Slovakia in 1931. At the age of 16, he was forced to leave his home and family after the Soviets installed a puppet regime in Czechoslovakia after the war. He went first to Austria, then to Germany, and finally to America on a United Nations boat for war refugees. In Colorado, he met his bride-to-be Donna Tighe and in 1958, they made their way to Fairbanks. The Tatra 87 is also from Czechoslovakia, named after the mountain range that forms the border between Slovakia and Poland. 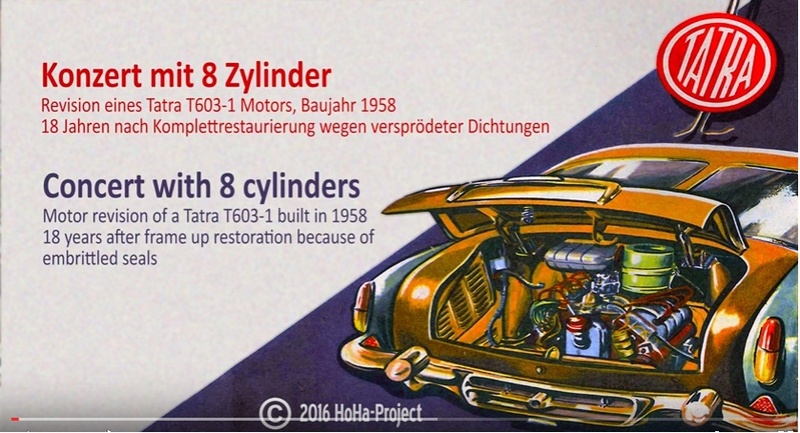 It was built in 1947 by Tatra, one of the oldest car manufacturers in the world. Tatra has been producing cars and trucks since 1897. This Tatra 87 originated in central Europe. The Tatra, a luxury five-seat sedan, was called the “Nazi killer” and the “Czech secret weapon” during World War II because it was so powerful and aerodynamic that German soldiers had a tendency to kill themselves in it speeding around occupied Czechoslovakia. It could reach speeds of nearly 100 mph. Even today, nearly 70 years after it was manufactured, the Tatra 87 is a unique automobile. 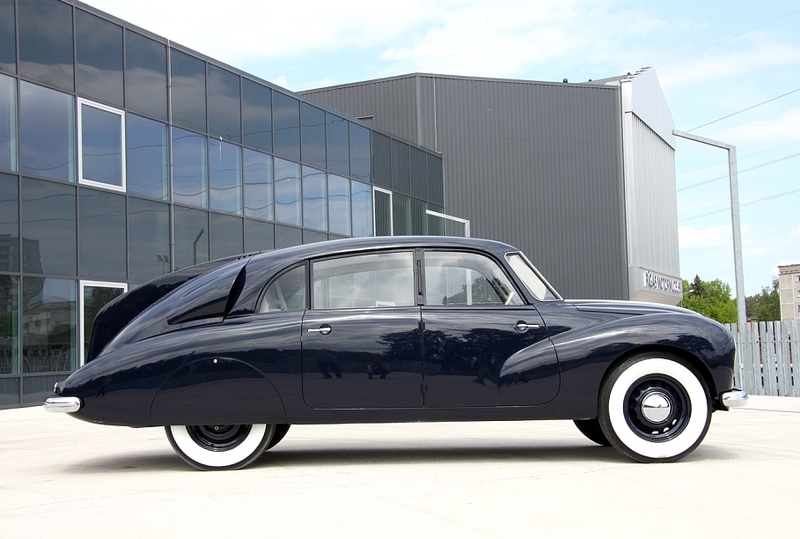 It is streamlined, based upon the design of the Tatra 77, the first car designed for aerodynamic purposes. The car has three headlights. Its sleek, air-slicing curves are highlighted by a large rear fin. That fin helps divide the air pressure on both sides of the car, a technique used in later aircraft, according to Wikipedia. Combine that design with a rear-mounted, air-cooled overhead cam V-8 engine, and you have a truly unique car that looks like a zeppelin and drives like a speedboat. Design elements of this car were copied by later car manufacturers, including Ferdinand Porsch. He was sued by Tatra for his design of the Volkswagen Beetle. This particular car was discovered about 25 years ago by Paul Gavora’s brother Svetozar. He acquired it as an undriveable, rusting hulk. Sveto was determined to restore the car himself and he tinkered with it for years. Fifteen years ago, Paul Gavora came upon the vehicle, lying in pieces in Sveto’s garage in Slovakia. 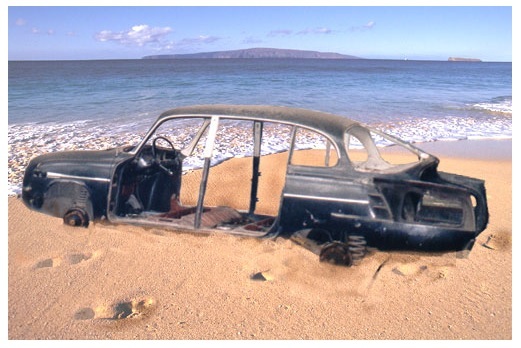 It took years, but Paul finally convinced his brother to sell the car to him. 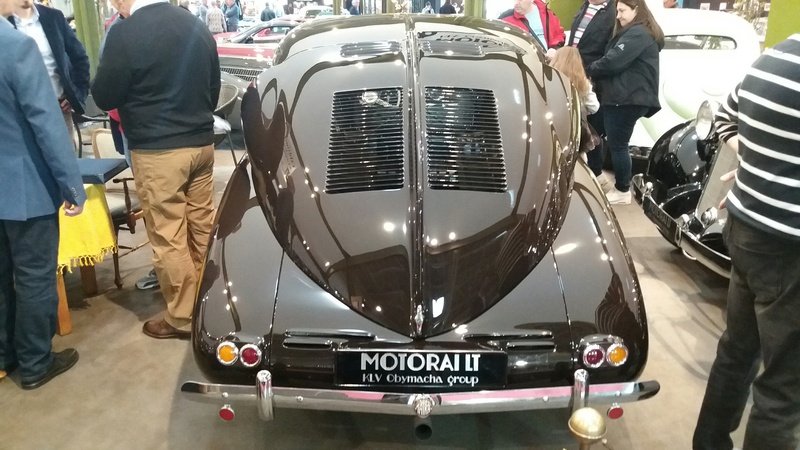 Then Paul and his nephew Martin Gavora had the car shipped to the original Tatra headquarters in the Czech Republic to be restored. The result is a gleaming blue, rare antique car with all its original parts, including the original V-8 engine. 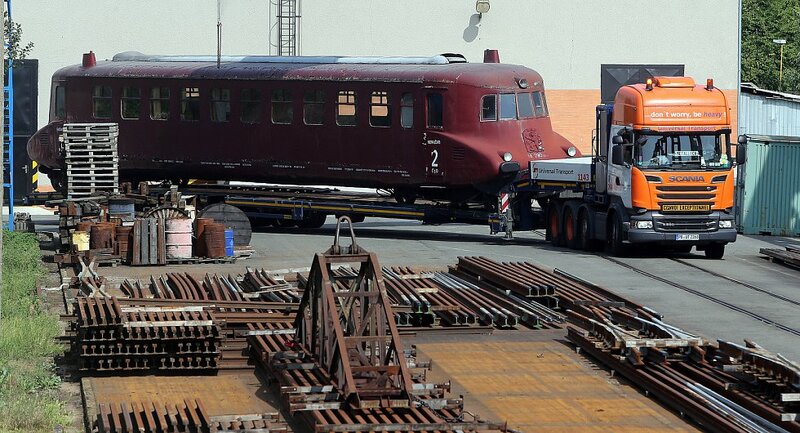 From the Czech Republic, the newly-restored Tatra traveled by truck to Antwerp Belgium. From there, it was placed in a shipping container and made the long trip across the Atlantic, through the Panama Canal and up the West Coast to Seattle. There, Paul’s son Matthew Gavora put the car on a trailer and towed it up to Fairbanks. 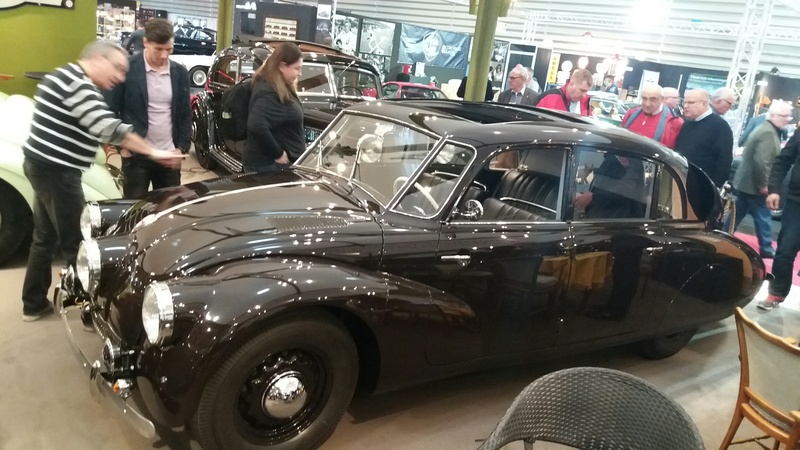 Other Tatra 87s are on display in museums and private collections all over the world. But Fairbanksans can see the local Tatra 87 in the Golden Days Parade on Saturday, driven by owners Paul and Donna Gavora. It’s a spectacular way to celebrate the end of a very long journey.